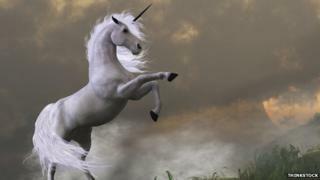 Scottish independence: How many unicorns do you earn? How many unicorns would it take to do your weekly shopping? This sounds like the start of a bad joke, but it's a question people would have tackled every week in medieval Scotland. The unicorn, the groat, the ryal, penny, and merk are all coins from Scotland's past and, on Wednesday, economist Prof Gavin McCrone will tell MSPs at Holyrood that an independent Scotland could revert to an old Scottish currency pegged to the UK pound. So, what did Scotland's currency look like before the Union in 1707, and what can it tell us about Scotland's past? This is the coin Prof McCrone thinks could reappear in Scottish pockets after 300 years. It was in circulation from the late 16th century, so maybe it's what James VI used for his taxi fare to London when he became James I of England in 1603. It was worth 13 shillings and 4 pence, or about two thirds of a Scottish pound. If Prof McCrone's suggestion is taken up in an independent Scotland, the new merk would be pegged to the UK pound. It might seem bizarre that Scotland dedicated a coin to a mythical beast until you learn that the unicorn is Scotland's national animal. It was first used in royal Scottish symbolism in the 12th century and it straddles one side of the UK royal arms to this day. The coin was worth about 20 shillings, and you could also carry about a half-unicorn which wasn't as horrific as it sounds. A record states that, in 1503, James IV gifted 100 unicorns to an English ambassador. James III issued this coin in 1484 and it's notable because of the image on the "heads" side. Previously all Scottish and English coins used stylised, cartoon images of kings, but these were the first to show a monarch in a life-like style which we recognise today. Also, the closed "imperial" crown shows that James III thought of himself as an all-powerful emperor in Scotland. This reputation was damaged slightly when rebellion happened and he was killed a few years later. This coin was struck to commemorate the marriage of Mary Queen of Scots and Lord Darnley in 1565. It was worth about 10 Scottish shillings, but is more interesting for the marital strife it gives us a glimpse of. The first coin (pictured above) has Lord Darnley's name before Mary's, suggesting he held the power in the relationship. It was quickly withdrawn from circulation, and replaced by a coin with Mary's name first. It was probably quite awkward the next time they left a tip for a waiter. This is Scotland's first ever coinage, minted by King David I in the 12th century, which is why his face looks a little worse for wear. The Scottish coins were actually struck in England. When Henry I of England died in 1135, David took control of the town of Carlisle and started to use English technology to make his own coins. A very rare example of it sold at auction for £8,000 in 2012, showing that, if you look after the pennies, for nine centuries, the pounds truly do look after themselves. From this first Scottish penny, a separate Scottish coinage continued until the Act of Union in 1707. Three centuries later, are we about to see its revival?